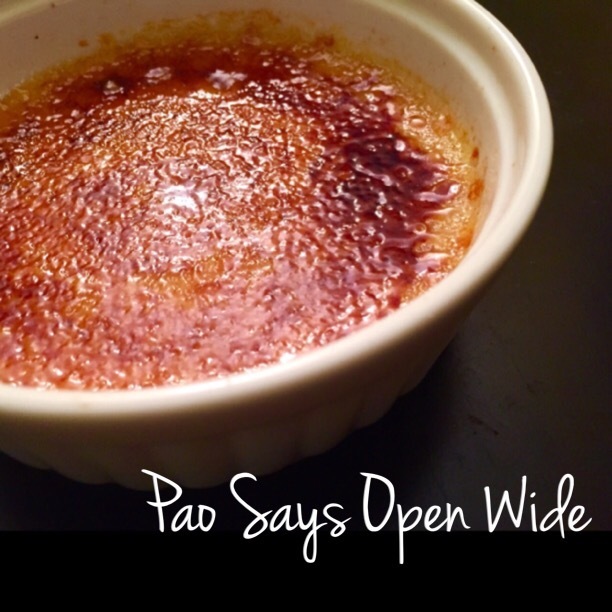 Pumpkin Spice and Everything Nice: Pumpkin-Spiced Creme Brûlée – Pao Says, "Open Wide!" My grandmother, Baba, and I share a similar passion for the delicate French dessert: Creme Brûlée. We’ve made it together multiple times and now I’ve gotten the hang of making it myself. Baba gifted me an awesome torch not too long ago and I am finally putting it to good use. My husband, Ryan, suggested I put a fall twist on the classic dessert and make it pumpkin spice-flavored, and I instantly deemed it a genius idea … Since fall brings out the basic B in all of us. So I searched for a good recipe and lo and behold… BAM! Emeril has the perfect one. This turned out to be amazingly delicious and not too overwhelming with pumpkin spice… It was just right. The only tweak I made to the recipe is hat instead of using cinnamon and nutmeg, I used McCormick’s “pumpkin spice”, which has cinnamon, nutmeg, allspice… And everything nice.